I rescued Calicat once before, and that was two months ago. I learned then that she has been stuck in a tree at least five times, so it seemed pretty likely that I would see her again. Indeed, I did. 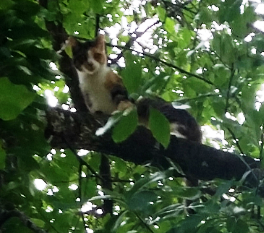 Calicat got stuck in a tree for her sixth time, this time, after being chased up the tree by some new dogs in the neighborhood who acted rather un-neighborly. 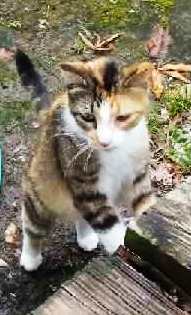 On my first rescue of Calicat, I learned that she is very skittish, especially with strangers. That time, she never let me get anywhere near her. I simply got above her, and, as I came down closer to her, she climbed farther down the tree. I didn't rescue her, rather I scared her down. I hoped to use the same strategy this time, but that depended on the tree and her position in it. I needed to place my rope in a position that would allow me to climb up above her without passing very close to her. Otherwise, I would end up scaring her up the tree. When I arrived, Toni led me to the tree where I found Calicat perched near the end of the lowest branch, which was only 15 feet high. 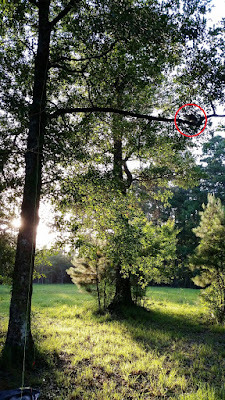 This was good news to me, since I could set the rope next to the trunk of the tree, a safe distance away from Calicat, and climb up to her branch thereby preventing her from climbing any higher. Unfortunately, that left me with another problem, since her branch was pretty long, and I was not sure I could get close enough to her. 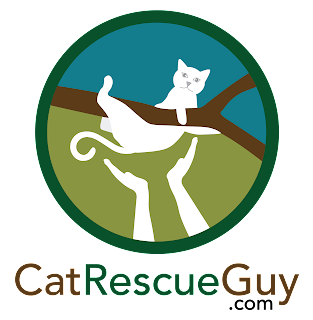 Calicat remained calm and in place as I set my rope in the tree. When I climbed up to her branch, she began to move farther out to the end of the branch. I was limited in how far I could go out on the branch, but I went out about as far as I could, and at that point, we reached a bit of a stalemate. I knew she was not going to come any closer to me, and she was just out of range of my net and rescue pole. Calicat could have it easier on me by simply jumping to the ground. After all, she was only 15 feet high. But she clearly was not going to do that, or she would have done it three days ago and saved us both some trouble. I had told Toni to be prepared to catch her if she jumped or fell, so Toni was already down below with a blanket between her arms ready to at least break Calicat's fall, if not catch her. So, with darkness quickly approaching, I asked Toni if it would be alright with her if I simply used my weight to shake the branch and force Calicat to fall. She agreed, so I jumped up and down on the branch and watched as Calicat held on and adjusted her position as expertly and quickly as only a cat can do. She was still standing there. So I tried one more time, and this time, she began to lose her footing, and with a little more encouragement from me, she fell. Toni just missed catching her, but Calicat landed safely on the ground and quickly ran back to her house where she hid underneath. I packed up as quickly as I could, since I knew that Calicat was not going to emerge from under the house until I was gone. The next day, Toni let me know that Calicat was doing just fine and looking good. As proof, she sent along these pictures of her for which I am grateful. While I had my camera with me, I forgot to turn it on, so I have no video of this sol-called rescue.